You are here: Home / Uncategorized / Busy weekend! I love long weekends and this weekend is no exception and I have been busy. Yesterday was spent replanting 40 tomato plants and 30 chilli plants. Today was spent tying up said plants and getting the office set up soon to be followed by some baking for a charity event tomorrow. I will post piccies when I am done. Lunch was awesome today. 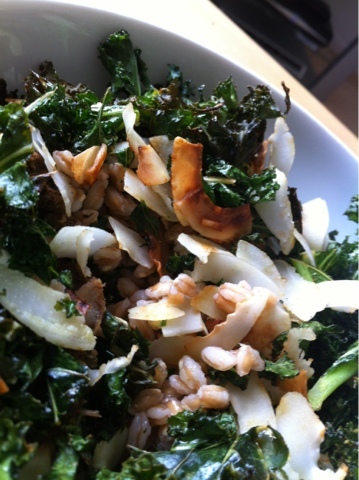 Tried farro for the first time with crispy kale and coconut. Check out the kale recipe on my blog. This time I reduced the soy sauce to 1/2 tsp so that it would be less salty and served over cooked farro. The whole thing was chewy lovely deliciousness! Well off out to enjoy the fleeting sunshine with a visit to our local beer festival.